Work At Home Jobs are Awesome, but I prefer a much more passive way of working from home, check out My #1 Recommendation, it’s how I made over $13,000 online last month! If you’d like to stay in the loop on who’s hiring work at home positions, feel free to sign up for email alerts below. I’ve partnered with ZipRecruiter to give my readers new updates on Work At Home positions. These emails will come directly from ZipRecruiter, but if you have questions you can respond and I will receive the email. Are you looking for a legitimate scam free way to work at home? Perfect because you just found a great resource that you can use to find the perfect work from home job for you. On this page, you’ll find links to thousands of companies hiring work at home positions. You can get started below by choosing the best category for you. Below the list of categories, I give you a brief description of each type of WAH job. If there’s a site, I prefer I will also recommend them below. If you have any questions about the WAH Jobs below, please leave comments below. Let’s get started finding the best Work From Home Job for YOU! If you’re currently working or know of other Work At Home Jobs that fit into the following categories, please leave me a comment making me aware so we can all have access to your job lead! If you’re looking for a work from home job, you’ve probably heard about Data Entry. Basically, with a Data Entry job you will be providing short tasks, this could mean transfer files from one form to another, putting things into categories, or any job that is time-consuming, but usually pretty easy. Data Entry can be done in your spare time or even as a full-time work from home job. These work from home opportunities are writing jobs. Most of these sites work on a per job basis where you will be bidding jobs or asked to write a particular post for a company. You can find all kinds of writing such as informational posts, press releases, list posts, and much more. Of course being a decent writer is a requirement, and better writers have any easier time getting off the ground and pulling in jobs. These work from home opportunities are pretty specialized, but the companies offer training. What you will be doing is finding out of place websites within search results. These companies pay hourly and can be a full-time or part-time job. If you have a general understand of how search engines work you can probably make a living from home being a search engine assessor. Pretty good with the camera? Here are some sites that will allow you to sell your photos online. There aren’t very many full-time positions available in this field, but you can post photos for sell. These sites take a commission for bringing you together with the buyer, but it is possible to make a solid online income from posting your photos for sale. This field is very competitive, but if it’s your passion and you’re good at it, there is no reason why you can’t work from home as a photographer. I highly recommend the products at Digital Photography School. Specifically, their E-Book called Going Pro. Which takes you through everything you need to know to start selling your photos online! These work from opportunities are transcription jobs. If you’re not familiar, Transcription is converting audio files into text. You usually get paid per audio hour, and all sites have different rates. The qualifications for most sites are a good listener, good to excellent typists, and the ability to work from home. These jobs are usually very flexible and pay pretty well once you get the hang of transcription. Most jobs require you to have a high-quality headset and foot pedal. If you have any interest in transcribing from home, make sure to check out the course at TranscribeAnywhere. The course will teach you how to transcribe and how to find high-paying transcription jobs. You can also sign up for their Free 7-day course just to make sure Transcription is right for you! Have a background as a secretary or assistant? You can now do the job you’ve been doing for years all online. It’s hard to put an exact description as what you will be up to as a VA, but it’s all up to whoever hires you. VA duties can include scheduling appointments, responding to emails, writing, answering phone calls, or anything they ask you to do. Make sure to check out the course 30 Days or Less to VA Success. The course shows you exactly how to make money as a Virtual Assistant and covers how to find work, how much you should charge, etc. They also have a few freebies you should check out. One is an e-book of 150 VA Services you can offer, and here’s a blog post that covers the basics of becoming a VA! You can actually teach people from home. Most of these sites require at least a degree from a college or university and some require a degree in a certain area. These sites tutor in all kinds of subjects at all age levels. As long as you meet the qualifications you can make some extra money in your free time or rev up your hours and make a decent living from tutoring students online. Are you bilingual? You may have what it takes to meet the requirements of a work at home translator or interpreter. Most of these jobs consist of translating documents, transcribing audio files into another language, or interpreting phone calls. Do you want to get paid $10 plus for less than 30 minutes of your time? Usability Testing might be a good option for you! Get paid to give you feedback on company websites. Record your screen and voice as you work through tasks on websites. Let them know what’s working great and what can be improved. These might not be Work At Home Jobs, but they are cool, easy ways to make extra income with your vehicle, driving, or by running errands. Everyone has an opinion; you might as well get paid for it. Here’s a huge list of paid online survey sites that pay you for sharing your opinion. These are what I like to call “paid to do” sites. These sites pay you to do things like surveys, offers, videos, music, and much more. Get points or cash that can be exchanged for prizes and gift cards. I’m a huge fan of making money online anyway I can. In this work at home category, you’ll find all the smartphone apps that will pay you money. These apps might pay you to take surveys, download other apps, unlock your phone, or shop. The earning potential with your smartphone increases every day! Everyone loves to shop, or at least has to grocery shop, right? In this work from category, I’ll show you all the sites and apps that will pay you cash back for shopping. This is another extra side income opportunity that’s very popular, but there’s a lot of scams out there, so you have to be careful. Most of these jobs have a few requirements but are easy to join. I’ll cover normal mystery shopping jobs along with phone jobs and apps. You’re getting paid to go to a store and collect information as a customer. Mystery Shopping jobs range from $5-$100+ per job. Want More Work At Home Job Leads? I really hope that you found what you were looking for inside this Free Work From Home Jobs Directory. I do my best to keep these lists as updated as possible, along with linking to my full reviews of job leads as I cover them. But if you did not find what you wanted here on this page, you may be interested in some of the ways I recommend to make money online and work at home. To see my recommendation you can check out these extra income sites or check out My #1 Recommendation, it’s how I made over $13,000 online last month! Do you have more WAH jobs to add to this free directory? Held one of these work at home positions? 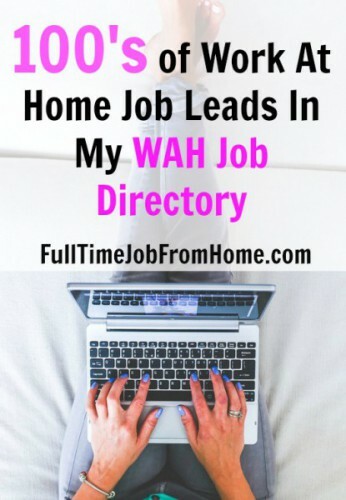 Let me hear your comments on this WAH job leads directory in the comments below!